The greatest legends from the time when gods and godesses roamed the earth and mingled with humans. In Greek mythology, Helen was the most beautiful woman from the age of the heroes. She was the wife of Menelaus, king of Sparta . After Helen ran away with Paris, prince of Troy, the Greek armies fought a ten year long war against Troy to win her back, as told by Homer. Christopher Marlowe, called her, the Face that Launched a Thousand Ships. Although on an epic scale, the Battle for Troy involves some very personal grudges between the warriors. The climax of our story is the showdown between the Greek Achilles and the Trojan Hector. One of the most famous tricks of all time. 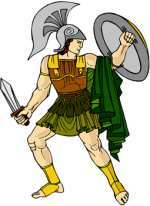 The war between the Greeks and the Trojans is in its tenth year. The Trojans rejoice when they wake up one day to find that the Greek army has finally departed. They have left behind them a strange gift – a giant wooden horse. How Odysseus and his men found themselves trapped in the cave of the terrifying Cyclops, the one-eyed giant. Only one of the famous tricks of Odysseus can save them. Odysseus sends his men to explore the interior of a mysterious island. 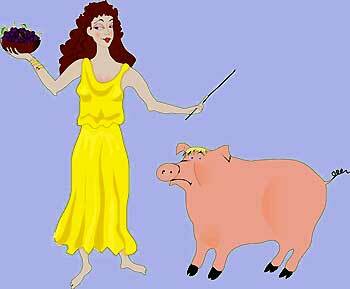 They are enchanted by the singing voice of the beautiful Circe who then turns them into pigs. Odysseus comes in search of his missing men. Odysseus returns home 20 years after leaving for Troy. He arrives on his rocky island kingdom of Ithaca disguised as a beggar and finds that his palace is full of suitors wooing his wife, the faithful Queen Penelope. How Theseus killed the Minotaur with the help of Ariadne – an exciting myth from Ancient Greece with some historical background about King Minos and Crete woven in. The myth of how Daedalus made wings out of feathers and wax and flew away from imprisonment by King Minos on the island of Crete. His son Icarus ignored his warnings and flew too close to the sun. King Midas entertains a satyr. As a reward he receives a gift – everything he touches turns to gold. He soon learns that the gift is a curse . The ancient Greek story of Orpheus the musician, who traveled down to The Underworld to try and bring his bride back from the dead. Told in Bertie’s verse. Tragic and sad .